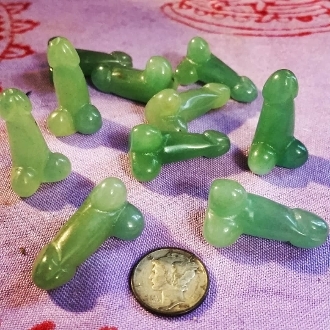 Mini aventurine phallus mojo charms with green mojo bag for your prosperity spells! Dress with one of my prosperity oils, such as Cash Conjure, Business Butter, Debt Free! or Wealthy Way depending on your needs. You can add other prosperity spell items/herbs/roots as you wish. Carry with you near your wallet or keep in your money jar/safe. Can also be used for health and fertility-use with my Fertile Myrtle, High John or Dragon's Blood oils.